A calendar for 2013 with 1 page per month each with a view of one of the villages in the Colne Valley near Huddersfield. Size is A4. An ideal Xmas present for somebody in Golcar or the Colne Valley or who has moved away. Framed panoramic pictures of Golcar and the Colne Valley. These photgraphs are printed on high quality photo paper then mounted in acid-free mount board and framed in a real wood frame with silver finish and black sight edge as shown in the picture. Image size is 24 x 12 inches with 1.5" mount. View of Golcar. Print on gloss photo paper, mounted and framed as above. A view of Golcar during a storm with rainbow. Print on gloss photo paper, mounted and framed as above. 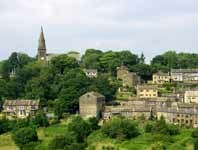 These photographs of Golcar and surrounding villages in the Colne Valley are available mounted and framed, ready to hang. Each image is approximately 30 x 40 cm with a 5 cm cream mount and a light wood frame.